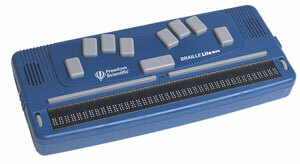 Braille Lite with 40-cell refreshable braille display (RBD) along front edge. currently in widespread use for displaying braille are embossed paper braille—which has been more or less available ever since Louis Braille invented the braille alphabet in 1829—and refreshable braille—which has been available for barely twenty years. Both forms of braille can be produced by personal braille writing methods; paper braille is also produced by braille printing houses. Paper braille is often the most pleasant to read and has the advantage of being low-tech and reasonably portable. Familiarity with paper braille is also important for developing literacy skills in children. However, paper braille has a number of drawbacks because of its bulk. That is, the costs of storing and shipping paper braille are such that, when an electronic copy is available, it can sometimes be more cost-effective to emboss a new copy rather than to retain an old one. Another disadvantage of paper braille is directly related to the tactile nature of reading braille: tactile skimming of text is much more difficult than visual skimming. Methods for producing paper braille have been described in recent articles by Carol Tobe and by Geoffrey Bull. A refreshable braille display or RBD produces braille by raising and lowering pins in response to an electronic signal. Current commercially available RBDs like the one in the above picture utilize piezoelectric crystals. RBDs make transitory braille possible. RBDs can display digital information, including that from the Internet, as ASCII characters in braille; thus either Computer Braille Code—which maps standard print characters one-to-one to the braille cells—or transcribed braille can be displayed. An RBD is a significantly more revolutionary reading device for a braille reader than is a computer monitor for a print reader. RBDs also add a new modality for deafblind persons to communicate in real time. As emphasized in an article on RBDs by Dr. Judith Dixon, the interactive digital nature of an RBD, in constrast to embossed paper braille, means that its software interface has the potential to greatly enhance its functionality. With the aid of screen readers and other software, RBDs make it possible for Braille readers to enjoy much of the flexible navigation of electronic texts that is available to print readers. The major drawback to current RBDs is their expense. An RBD with a 40-cell display costs approximately $5000. There are several on-going research projects looking into ways of producing RBDs more cheaply that are described Dr. Dixon's article. Unfortunately, as Dr. Dixon points out, funds available for research and, especially, development in this area are limited. One innovative device, the Rotating-Wheel Based Refreshable Braille Display, attempts to reduce costs by rotating the cells under the reader's fingertips so that only a few cells need be actuated at a time. This device is currently being developed by the National Institute of Standards and Technology. There are several informative articles on tactile displays in a recently published book on the past, present, and future of braille. (These well-written and well-documented articles are valuable resource material. "Embossed Printing in the United States" by Carol B. Tobe, Museum Director at the American Printing House for the Blind. This article presents a fascinating and detailed history of the last 150 years of printing methods for braille and other tactile systems. The article states, "Only in the last third of the twentieth century has braille production moved beyond the mechanical stereotype machines and hand-fed printing presses that served so well for so many years." The article concludes with a history of personal braille writing devices including the slate and stylus and braille writers or braillers with some similarity to mechanical typewriters. "Alternative Methods of Braille Production" by Geoffrey Bull, President of Braille International, Inc. and former production direction of the Royal National Institute for the Blind in the United Kingdom. This short article includes a description of embossing and thermoforming along with the less well-known methods of "producing raised dots and lines by superimposing one material upon another." Both thermoforming and some of the latter methods are less acceptable to the braille reader due to their plastic, sticky, or rubbery tactile properties. There is still hope for methods, similar to "swell paper", that involve a curable lacquer on a substrate. These methods have the advantage that they can reproduce arbitrary diagrams and not just braille. Mr. Bull also poses the question as to whether, "the time [is] fast approaching when it will be more cost-effective for the Government to issue all braille readers a braille display and provide all of them with their own copies of books and magazines in digital format?" "Refreshable Braille Displays: Their Origins and Evolution" by Judith M. Dixon, Consumer Relations Officer for the NLS/NLB. The history of different RFB hardware is outlined. Technical and other obstacles to the development of RFBs are clearly explained along with descriptions of current research on alternative hardware strategies for RFBs. This article describes various ways that the synergy between software and hardware enhances the value of the RFB. This page was first posted on January 4, 2002 and last updated on January 10, 2002.